Read Only Memories is a cyberpunk tribute to '90s games and features queer characters. GaymerX is a group of people who run the website GaymerConnect and organize the GaymerX gaming convention. With the mission of educating and driving greater acceptance in gaming, the group is working with MidBoss Games to make its first game, a cyberpunk adventure called Read Only Memories. In 2064, ROMs have taken the place of mobile technology. The player is a journalist in Neo-San Francisco and receives a beta of the latest ROM and a mysterious note from a friend. Through the game, the player discovers more mysteries surrounding ROMs and Parallax, a company for which the player's best friend worked. Additional ROMs install new personalities in the main character. Visibility of queer characters is minimal in the whole of games today. MidBoss and Gaymer X write in a day one update, "Thank you for believing in adventure games and creating a world where we can feature characters that normally don't get the spotlight in games." Read Only Memories will have both queer and non-queer characters; GaymerX will speak with the community to elicit feedback on these characters. 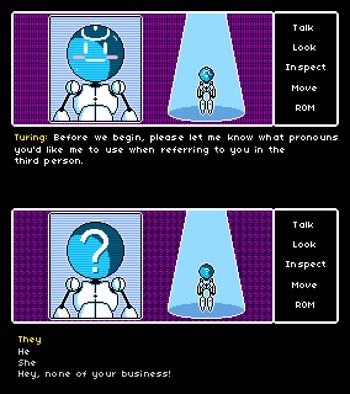 Two screenshots included in the Kickstarter page indicate the player selects which pronouns he/she/they/"Hey, none of your business!" wishes to use. Read Only Memories is a part of Ouya's Free the Games Fund. If the crowdfunding campaign is successful, the game will release for Windows PC, Mac, Ouya, iOS, and Android. If the project reaches its first stretch goal at $82,064, a Linux port will be available for free with the Mac and PC versions. The campaign ends Dec. 13. Should there be no problems, the game will launch Nov. 2014. GaymerX plans to have a playable version ready for next year's convention, GaymerX2 in July.